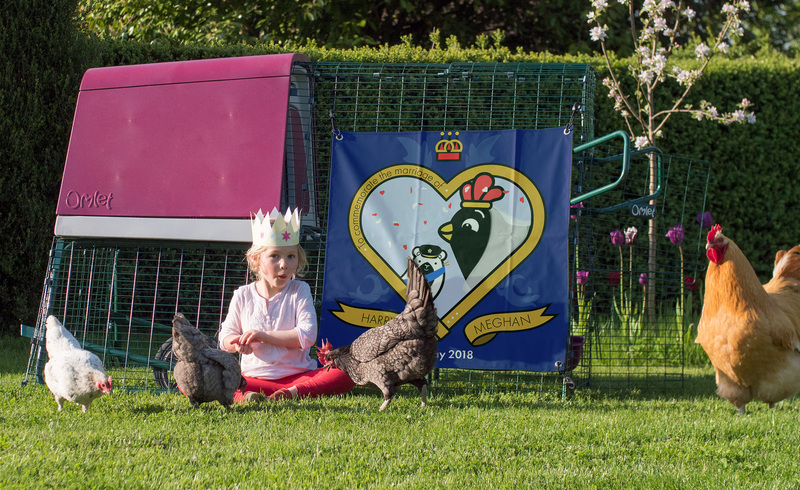 Claim your FREE Royal Wedding Eglu Run Cover this weekend only when you spend over £50! The Free Special Edition Royal Wedding Eglu Run Cover is only valid with orders over £50 (excluding delivery) placed on Saturday 12th and Sunday 13th May. There is limited stock of the Royal Wedding Eglu Shade and will be given to the first 100 customers that place orders across all countries. Please use promo code ‘WEDDING’. The cover measures approximately 80cm x 80cm and comes supplied with bungee hooks so it can be easily attached to your run. It should be used as a sun and wind shade. Subject to availability. Omlet ltd. reserves the right to withdraw the offer at any point. « Guide to keeping Chickens!